Ruth Bryan Owen, daughter of “The Peerless Leader,” three–time Democratic presidential candidate William Jennings Bryan, inherited her father’s political gifts as a communicator and, like him, pursued a reform agenda in the House of Representatives. 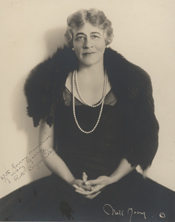 Known for her strenuous campaign efforts, oratory, and devotion to constituent services, Representative Owen became the first woman to serve on the House Foreign Affairs Committee. Ruth Bryan attended public schools in Washington, D.C., and the Monticello Female Academy in Godfrey, Illinois. She entered the University of Nebraska in 1901 and took two years of classes before marrying the artist William Homer Leavitt in 1903. They had two children, Ruth and John. In 1908, she served as her father’s traveling secretary during his third presidential campaign. Despite her fundamentalist father’s objections, she divorced Leavitt and, in 1910, married Reginald A. Owen, an officer of the Royal British Engineers. The couple had two more children, Reginald and Helen. The family lived at Reginald Owen’s numerous overseas duty posts. In Cairo in 1915, Ruth Owen joined the British Volunteer Aid Detachment as a nurse to care for convalescent soldiers. Owen also established a volunteer entertainment troupe, the “Optimists,” that performed at military hospitals in the Middle East.3 When her husband’s health failed in 1919, she moved the family to Miami, Florida, to be near her parents. For the next 10 years, she spoke on a professional lecture circuit and served as a faculty member and on the board of regents at the University of Miami. A year after her father’s death in 1925, Ruth Bryan Owen decided to run for the House of Representatives in a district along Florida’s Atlantic coast. In a state that refused to ratify the 19th Amendment, she narrowly lost in the Democratic primary to six–term incumbent William J. Sears by 800 votes. When Owen was widowed the next year, she had apprehensions about her role in politics: that “there was not the friendliest feeling toward any woman taking her place in political life.”4 Yet, Owen did not leave the political arena; she ran again for the same seat in 1928. In an effort to “meet the voters” before the primary election, she reached out to dozens of newspaper editors with promotional materials.5 Her relief work after a devastating hurricane ripped through Miami in 1927 also drew attention to the determined candidate. Owen’s efforts were not in vain, and she triumphed over Sears in the 1928 Democratic primary by more than 14,000 votes. The campaign fight, however, was not over for Owen. Lawson contested the election, charging that Owen had lost her American citizenship upon her marriage to an Englishman and then living outside the United States. He claimed that she was ineligible for election to Congress because she had not recovered her citizenship under the provisions of the 1922 Cable Act, which allowed women married to foreign men to petition for repatriation upon their return to the United States, until 1925. This did not allow for the seven years’ citizenship required by the Constitution to run for U.S. Representative. Unfazed, Owen put her oratorical skills to work. She offered a persuasive and successful defense of her eligibility before the House Elections Committee, exposing the deficiencies of the Cable Act and leading to an eventual amendment to the law. Her audience convinced, she was sworn in at the start of the 71st Congress (1929–1931) on March 4, 1929. Owen won the Democratic nomination and ran unopposed in the 1930 general election. The early success of the fruit fly measure was testament to the novel manner in which Owen kept in touch with her constituents in Florida. In a time before congressional Members maintained district offices, Owen maintained a “resident secretary,” Walter S. Buckingham, who remained in Florida and kept her abreast of local events. Buckingham also passed out questionnaires to constituents, polling their wants and needs.9 Although Owen also developed an intricate plan to visit all 18 counties in her massive district on congressional breaks, she was determined to bring some of her constituents to the nation’s capital.10 She established an annual program (using some of her own money) to bring high school boys and girls from her district to Washington, D.C., for training as future leaders. Owen’s political career did not end after she left Congress. In April 1933, President Franklin Roosevelt appointed Owen, a longtime family friend, as Minister to Denmark—making her the first American woman to head a diplomatic legation. Ironically, one of her first duties was to ease Danish concerns about the high duties created by the Smoot–Hawley Tariff, one of Owen’s controversial votes. On July 11, 1936, Owen married Captain Borge Rohde of the Danish Royal Guards. Because her marriage meant that she was a citizen of both Denmark and the United States, she had to resign her diplomatic post, but Owen spent the fall of 1936 campaigning for Roosevelt’s re–election. From 1938 to 1954, she served on the Advisory Board of the Federal Reformatory for Women. In 1949, President Harry Truman appointed her as an alternate delegate to the United Nations General Assembly. Owen lived in Ossining, New York, lecturing and publishing several well–received books on Scandinavia. She died in Copenhagen on July 26, 1954, during a trip to accept the Danish Order of Merit from King Frederick IX recognizing her contributions to American–Danish relations. 1Hope Chamberlin, A Minority of Members: Women in the U.S. Congress (New York: Praeger, 1973): 74. 2J. Elliot Ramsey, “Double Helpings of Fame,” Delineator, January 1937: 11. Also quoted in, Dorothy M. Brown. “Rohde, Ruth Bryan Owen,” American National Biography 18 (New York: Oxford University Press, 1999): 782–783. 3Karen Foerstel, Biographical Dictionary of Congressional Women (Westport, CT: Greenwood Press, 1999): 213. 4Current Biography, 1944 (New York: H.W. Wilson Co., 1944): 522–525. 7Atherton, “‘The Lady From Florida’ Works Fast,” 20 October 1929, Washington Post: SM7. 8Chamberlin, A Minority of Members: 73. 9Congressional Record, House, 71st Cong., 2nd sess. (18 December 1929): 925. 11David T. Canon et al., Committees in the United States Congress, 1789–1946, Volume I (Washington, D.C.: Congressional Quarterly, Inc., 2002): 572. Political scientist Charles Stewart III rated the committee as the ninth most “attractive” panel of the 29 committees extant between 1875 and the major congressional reorganization in 1947. See Stewart, “Committee Hierarchies in the Modernizing House, 1875–1947,” American Journal of Political Science, 36 (No. 4, November 1992): 835–856; especially 848. 12Congressional Record, House, 72nd Cong., 1st sess. (11 January 1932): 1719. 13Congressional Record, House, 71st Cong., 2nd sess. (21 May 1930): 9314–9323. 14Susan Tolchin, Women in Congress (Washington, D.C.: Government Printing Office, 1976): 62. 15Congressional Record, House, 72nd Cong., 2nd sess. (31 January 1933): 3051. Papers: In the Marie Mattingly Meloney Papers, 1891-1943, 40 boxes. Includes 3 letters (1933-1934) between Ruth Bryan Owen and Marie Meloney. A finding aid is available in the repository. Papers: In the Frances Perkins Papers, 1895-1965, 71 feet. A letter (August 5, 1936) between Ruth Bryan Owen and Frances Perkins. A finding aid is available in the repository. Papers: In the Lou Henry Hoover Papers, 1874-1973, 182 linear feet. Subjects covered include Ruth Bryan Owen. Papers: In the William Jennings Bryan Papers, 1877-1940, 24.8 linear feet. Subjects covered include Ruth Bryan Owen. A finding aid is available in the repository. Papers: In the Martin Leaf Papers, 1914-1964, 0.5 cubic foot. Other authors include Ruth Bryan Owen. Papers: In the Frank L. Wood Papers, 1861-1939, 0.15 cubic foot. Other authors include Ruth Bryan Owen. Papers: ca. 1928-1934, 1 folder. Two letters, one to Mr. Blodgett regarding her Florida campaign for Congress, 1928; one to "Cora" regarding her work as a diplomat in Denmark and the "cold reception" by Secretary of the Interior Harold Ickes to the idea of becoming his assistant, 1934. Papers: In the Emma Guffey Miller Papers, 1900-1972, 1 linear foot. Subjects covered include Ruth Bryan Owen. An unpublished finding aid is available in the repository as well as a microfilm version. Papers: In the Fannie Hurst Papers, 1933, 1 folder. Includes one letter regarding a farewell dinner for Ruth Bryan Owen. An unpublished finding aid is available in the repository. Papers: In the Sue Shelton White Papers, 1909-1963, 1.25 linear feet. Subjects covered include Ruth Bryan Owen. An unpublished finding aid is available in the repository as well as a microfilm version. Papers: In the Mabel Vernon Papers, 1933-1947, 54 items. Correspondents include Ruth Owen. An unpublished guide is available in the repository. Papers: In the Carrie Dunlap Papers, 1907-1929, 58 letters. Contains approximately 15 letters between Ruth Bryan Owen and Carrie Dunlap. Papers: In the Emma L. Brock Papers, n.d., 15 items. Includes production material from Emma Brock's book titled Picture Tales from Scandinavia. Other authors include Ruth Bryan Owen. Papers: 1933-1942, 6 items. Correspondence between Ruth Bryan Owen and Marian Anderson. Owen, Ruth Bryan. Caribbean Caravel. New York: Dodd, Mead, and Company, 1949. ___. The Castle in the Silver Wood and other Scandinavian Fairy Tales. New York: Dodd, Mead, and Company, 1939. ___. Denmark Caravan. New York: Dodd, Mead, and Company, 1936. ___. The Duties of a Congressman / Remarks of Ruth Bryan Owen in the House of Representatives, December 18, 1929. Washington, D.C.: Government Printing Office, 1930. ___. Elements of Public Speaking. New York: H. Liveright, 1931. ___. Leaves From a Greenland Diary. New York: Dodd Mead and Company, 1935. ___. Look Forward Warrior. New York: Dodd Mead and Company, 1942. ___. Picture Tales from Scandinavia. New York: Frederick A. Stokes Company, Inc., 1939. "Ruth Bryan Owen" in Women in Congress, 1917-2006. Prepared under the direction of the Committee on House Administration by the Office of History & Preservation, U.S. House of Representatives. Washington: Government Printing Office, 2006. U. S. Congress. House. Arguments and Hearings before Elections Committee No. 1; Contested Election Case of William C. Lawson v. Ruth Bryan Owen, from the Fourth Congressional District of Florida. 71st Cong., 2nd sess., 1930. Washington: Government Printing Office, 1930. U. S. Congress. House. Report No. 968. Committee on Elections No. 1. William C. Lawson-Ruth Bryan Owen Election Case. Report of the Hon. Carroll L. Beedy, of Maine, chairman. 71st Cong., 2nd sess., 1930. Washington: Government Printing Office, 1930. Vickers, Sarah Pauline. "The Life of Ruth Bryan Owen: Florida's First Congresswoman and America's First Woman Diplomat." Ph.D. diss., Florida State University, 1994.